Wet to moist. Meadows, marshes, swamps, wetland margins, stream banks, pond edges, and roadside ditches. Full sun to light shade. This is an erect, 12″ to 28″ tall, perennial forb that rises on a single stem from a slender underground stem (rhizome). The stems are erect or ascending, sharply four-angled (square), leafy, and usually branched. They may have short, white, upward-curved, nonglandular hairs on the angles near the top but are otherwise hairless. The foliage is not aromatic. The leaves are opposite, thin, 1¼″ to 3¼″ long, and ⅝″ to 2″ wide. They are on 3 ⁄16″ to 1″ long leaf stalks. They become progressively smaller and shorter stalked as they ascend the stem. The leaf blades are lance-shaped to egg-shaped, broadly rounded or shallowly heart-shaped at the base, and taper to a sharp point at the tip. They are pinnately veined. The veins are conspicuously indented on the upper surface. The lateral veins end at the margin between the teeth. The upper surface is hairless. The lower surface may be hairless or sparsely covered with short, appressed or curved, nonglandular hairs. There are usually no unstalked glands on the lower surface. The margins are coarsely toothed. The inflorescence is a slender, elongated, spreading, 1¼″ to 4″ long arrangement (raceme) of up to 14 flowers rising from upper leaf axils. Each flower is on a short, slender stalk and is subtended by a 5 ⁄16″ to ½″ long modified leaf (bract). 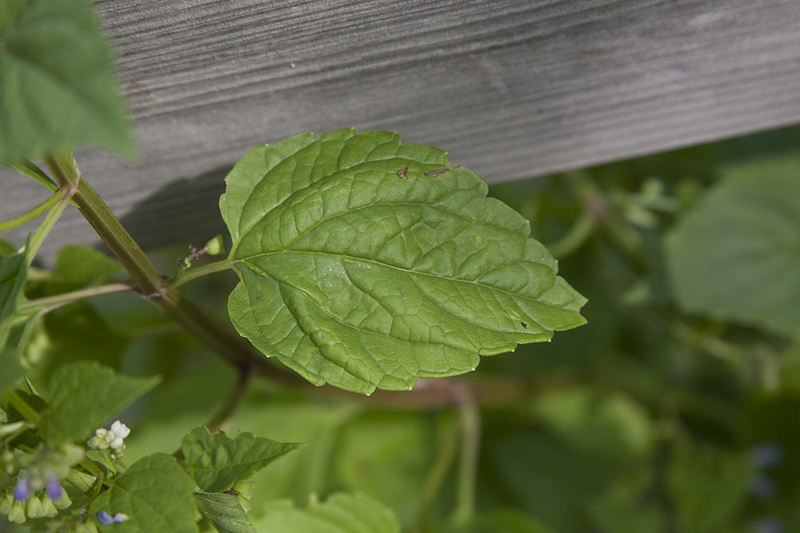 The bracts are leaf-like but much smaller than the leaves. The lower bracts are narrowly egg-shaped. They become progressively shorter and narrower as they approach the tip. Pairs of flowers, one in each opposite node, face in the same direction, often perpendicular to the pair of bracts. There is no raceme at the end of the stem. Occasionally there are solitary flowers rising from upper nodes, paired by one in the opposite leaf axil. The flowers are 3 ⁄16″to 5 ⁄16″ long. There are 5 sepals, 5 petals, 4 stamens, and 1 style. The sepals are light green to pale reddish-green and 1 ⁄16″ to ⅛″ long. They are united at the base and separated into 2 shallow, broadly rounded lobes at the tip. They do not have a spine at the tip. They are moderately to densely covered with minute, curved, non-glandular hairs. The petals are pale blue or light bluish-purple, rarely white or pink. They are united at the base into a long, narrowly funnel-shaped tube and separated at the tip into 2 lips. The tube is nearly straight above the calyx, not “S” shaped. The upper lip is unlobed, and and rounded. It forms a “skull”-shaped hood. The lower lip is often white and does not have dark spots or mottling. It is spreading or arched, slightly longer than the upper lip, and shallowly 3-lobed. The lateral lobes are short and ascending, not well developed. The lower lobe is oblong and usually slightly notched. The stamens have small anthers and do not project beyond the corolla tube. The style is branched at the tip and does not project beyond the corolla tube. The fruit is a dry seed capsule (schizocarp) with 1 to 4 seeds. Heart-leaved skullcap (Scutellaria ovata ssp. ovata) inflorescence is a terminal raceme of several flowers paired at nodes. The flowers are much larger. It is much rarer and restricted to the southeastern border counties. 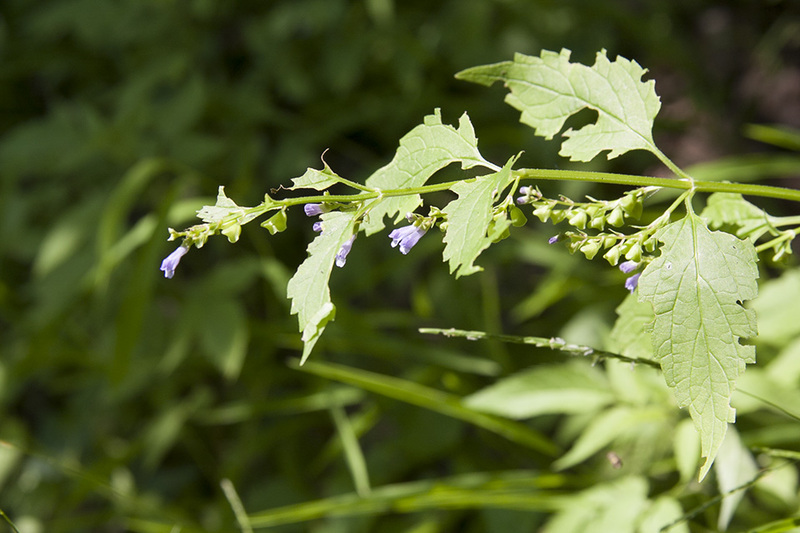 Leonard’s skullcap (Scutellaria parvula var. missouriensis) is much smaller, no more than 12″ tall, usually 8″ or less. The leaves are very often less than two times as long as wide. The margins are untoothed and often curled under. There are 1 or 2 veins on each side of the midrib. Lateral veins are not anastomosing. It sometimes produces short, white, self-pollinating flowers. Marsh skullcap (Scutellaria galericulata) leaves are mostly stalkless, with anastomosing lateral veins and shallow rounded teeth. The lower surface has no glands. The inflorescence is single flowers rising from the upper leaf axils. The flowers are much larger. The lower lip has a white patch and purplish-blue spots at the base. Sources: 2, 3, 4, 5, 7, 28, 29, 30. Referring to plant leaf veins: branching and rejoining, forming a network, before reaching the margin. The group of outer floral leaves (sepals) below the petals, occasionally forming a tube. A collective name for all of the petals of a flower. The small swelling of the stem from which one or more leaves, branches, or buds originate. Having the leaflets of a compound leaf arranged on opposite sides of a common stalk. A dry fruit formed from a compound ovary that splits into two or more parts (mericarps) at maturity.